New findings in treating autoimmune disorders: Marijuana can help! MMJ Doctors Colorado Springs > Blog > Medical Alternatives MMJ Blog > New findings in treating autoimmune disorders: Marijuana can help! It is estimated that approximately 50 million Americans are living and suffering with an autoimmune disorder. That’s huge! Chances are that you or someone you know has an autoimmune disease. Type 1 diabetes, Fibromyalgia, Celiac Disease, Grave’s Disease, Hashimoto’s Disease, Multiple Sclerosis, rheumatoid arthritis, and Lupus are all examples of autoimmune diseases that are currently affecting Americans. Symptoms of various autoimmune disorders range from extreme fatigue, difficulty concentrating, joint pain, extreme headaches, muscle weakness, inflammation, digestive problems, anxiety, and depression. Currently, there is no cure for these diseases which leaves people to manage their symptoms the best way that they can. This is often times frustrating and an extremely difficult task. Fortunately, a team of researchers in North Carolina may have found the answer to effectively treating some autoimmune symptoms! And the answer is…… Marijuana!!!! Marijuana is already being used to alleviate the symptoms of nausea, vomiting, and pain in some cancer patients. Its application can now reach even further to people with autoimmune symptoms! 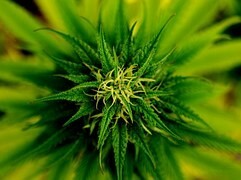 The team at University of North Carolina found that marijuana suppresses the immune system response. Their findings show that the THC in marijuana is able to chance the critical molecules of histones, which leads to the suppression of inflammation. So what does this really mean for people with autoimmune diseases? Basically, when a person has an autoimmune disease, it means that their own body’s immune system is targeting healthy tissues by mistake and attacking them. This leads to the barrage of negative symptoms that a person with an autoimmune disorder will experience. By suppressing an immune system’s negative response, symptoms are effectively decreased or eliminated altogether. This means that a person with an autoimmune disorder will be able to live a normal life free of debilitating symptoms with the help of Marijuana!